ANNISTON, Ala – Imagine a conversation about racecars between NASCAR’s Richard Petty and Henry Ford, airplanes between Orville Wright and Howard Hughes, or computers with Bill Gates and Steve Jobs. Two bright minds that eat, sleep and breathe their industries would no doubt share exciting ideas and possibly even come up with something new and innovative for the future. In September 2006, a real conversation and exchange of ideas did take place between two leaders and thinkers in the concrete and masonry industry ? Blastcrete Equipment Company’s president, Jim Farrell, and Jollay Masonry owner, Dave Jollay. While that conversation may not seem to compare to those mentioned above, it did result in the design of a machine that could help revolutionize the masonry industry: the Blastcrete Mason Mate. Farrell and Jollay, along with Blastcrete’s Craig Maddox, originally sat down to help resolve material handling issues for masonry grout in specific job applications. It was then that Jollay, whose company boasts an impressive resume as mason contactor on such projects as Turner Field, Phillips Arena, and the Georgia World Congress Center, really got Farrell’s attention with one powerful comment. “Even with all the equipment and material improvements over the last 50 years, many of the basic installation and logistic challenges have remained the same,” Jollay said. He continued on to explain the current design emphasis by structural engineers is to increase amounts of grout fill for CMU walls, even when non-loadbearing. This, combined with the challenge of alternate wall systems, cost inefficiencies, lack of job site storage, and safety concerns with dust exposure, proves there is truly a need for an engineered solution for grouted CMU walls, particularly for interior scope and high rise structures. Jollay qualified his final comment is true if masonry is going to stay competitive and increase market share in the buildings of the future. Farrell, who purchased the 60-year old Blastcrete Equipment Co. in 1983, had a history of thinking outside the box and really listening to his customers. While Blastcrete did not have a long history in the masonry business, Farrell recognized that a willing resource with as much experience as Jollay could be the architect to help the company develop an innovative machine for the mason. It was then the idea for the Mason Mate was born. Indeed it was. That’s because, historically, grout and mortar have been mixed and transported, either pumped, or hauled long distances in a mortar box with an expensive telehandler. Both Jollay and Farrell thought it would be more cost effective to move a dry pre-blended material in a package when labor costs, waste, dust and safety are considered. Once the two were in agreement on such a huge modification of the grouting process, Jollay began to point out other issues he felt needed to be addressed. “I explained to Jim [Farrell] that we needed a machine that was safe, simple, portable, compact and, obviously, cost effective,” Jollay said, when recalling the meeting. As the men talked, Farrell and Maddox pointed out proven components that Blastcrete had developed for other applications. They took the footprint discussed earlier and Jollay laid out the components of the machine. That produced drawings, which eventually resulted in the decision that Blastcrete would build a prototype. Blastcrete’s recent design of a two-stage continuous mixer that matched the output of its 2-inch squeeze pump was a radical change from historical batch mixers. But the two-stage continuous mixer met all of the requirements that Jollay had suggested relative to cost, portability, labor savings, and reduction of waste and dust. After months of testing the Mason Mate, things were moving full steam ahead – then a roadblock was encountered. Blastcrete was shocked to learn that the American Society of Testing Materials (ASTM) 476 specifically pointed out there was a minimum five-minute mixing time for masonry grout. There was no language in the rules that addressed continuous mixing, even though continuous mixing of mortar and grout had been used in Europe and Asia for decades. At that point, Blastcrete pulled the plug on promoting the machine for its original design – masonry grouting and mortar. But the door wasn’t closed yet. In 2008, inquiries from new customers provided an opportunity for Blastcrete sales manager, Tripp Farrell, to modify the Mason Mate for applying shotcrete in underground coal applications. These modifications resulted in the Mine Mate, and also provided an excellent opportunity to get real-time experience on the two-stage continuous mixer ? in extremely harsh conditions underground. A modified version of the original Mine Mate, the Mine Mate 1100, is now being used successfully for a patented rock dusting process, developed by BASF (the world’s leading chemical company), to improve safety in coal mines. 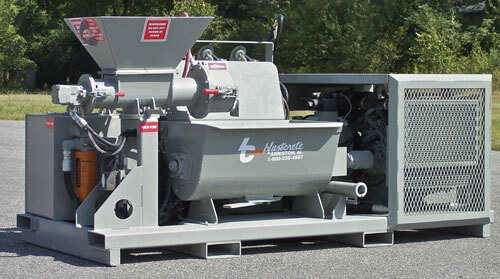 Blastcrete had now established credibility and confidence in the level of its two-stage continuous mixer. Almost immediately, other opportunities emerged for the Mason Mate and modified versions of it. For example, several machines have been sold to stucco and plaster contractors. And recently, the Mason Mate technology has been used for applications in asphalt and concrete overlay materials, more specifically Tensar International Corporation’s Endurablend Polymer Cement Slurry Surfacing system. Endurablend is used primarily as a pavement preservation solution for asphalt and concrete surfaces, as well as crack filling applications, and provides an aesthetically pleasing and durable new surface. Tensar’s patent-pending material is unique in that it has excellent bond characteristics on both asphalt and concrete surfaces. It was clear there was demand for a product like the Mason Mate. Everyone at Blastcrete knew, and Farrell still hadn’t given up on his new product. As he and his crew would soon find out, others also saw potential and weren’t ready to give up either. By 2009, a leading manufacturer of pre-blended mortar and grout had developed interest in the use of a continuous mixer for their silo systems. Two representatives from the company led the group to help modify ASTM C476, specifically item 5.2.1.1 in Section 3. This allows for the use of a continuous mixer for masonry mortar and grout, provided these pre-blended materials are mixed with water based on the recommendation from the manufacturer of the pre-blended materials. One employee from the manufacturing company is also a member of the C12 committee, which helped make the change. Thanks to the help from all these industry leaders, ASTM, as a group, recognized the benefit of continuous mixing. These changes now allow Blastcrete to continue with the original 2006 plan ? and the goal of revolutionizing the masonry industry with the Mason Mate. “It’s exciting to see that things finally might work out for the Mason Mate as originally intended, and really see if it can change and modernize our industry, ” Jollay said. “I think the machine meets the original criteria of being very portable and safe, while emitting less dust, and being quick and easy to clean.” And Jollay feels if it’s as cost effective as Blastcrete says it is, that will be the real icing on the cake.